This is my third post in a row where I have followed a recipe - that isn't like me! With work being so crazy (crazy is good), I didn't have the energy or creativity to do my own thing in the kitchen. Following recipes has been good for this week. 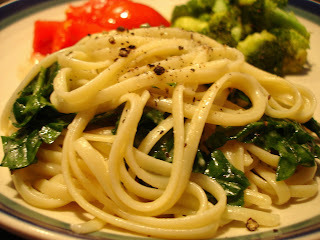 Last night I chose a recipe by Giada - Linguine with Butter, Pecorino, Arugula, and Black Pepper. I didn't have pecorino or arugula, so I replaced them with Parmesan and spinach. Add the linguine and cook until it is al dente, stirring frequently, about 8 minutes. Drain, reserving 1 cup of the cooking liquid. Immediately toss the hot pasta in a large bowl with the butter to coat. While tossing the linguine, gradually sprinkle the cheese, pepper, and enough of the reserved cooking liquid evenly over the linguine to moisten. Add the arugula and toss to combine. Season the pasta, to taste, with salt. I always use olive oil with pasta, never butter, but I loved how it coated the linguine and helped the cheese to stick. Arugula would have given it a nice nutty flavor that would have complemented the black pepper, but spinach was a fine substitute. When I'm looking for something quick and easy again, I would definitely think of this recipe. To cook them, he heated olive oil in a small saute pan, then added 2 large cloves of chopped garlic. 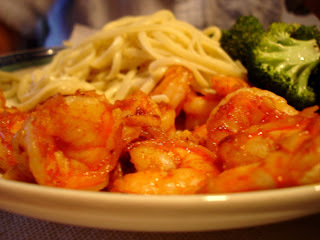 Then he added the shrimp, and mixed in some paprika, cayenne, and chili powder. They were such a beautiful color and smelled heavenly - I wish I ate shrimp! That looks so good and gives me some great ideas! That looks great! I'll keep that in mind for a good pasta dish.